No matter how Australia is examined and probed, it is certain to yield a character of diversity. Whether an investigator looks at the various natural monuments and sites famous for their beauty and impressive history and finds a wealth of different examples of nature’s splendor, or a sociologist considers the many types of jobs and careers available throughout Australia and finds a long and varied list sure to satisfy any professional interest, it’s clear that Australia is rich in elements of distinct types and backgrounds. The people of Australia, too, hail from a wide variety of backgrounds, and there are many immigrants each year who decide to make the country their new home by taking the Australian citizenship test and completing the other steps necessary for naturalization. For newcomers to Australia, this population diversity is bound to contribute to a sense of an open and welcoming community, though it can be especially important for promoting and supporting the modern multi-national family within Australia. 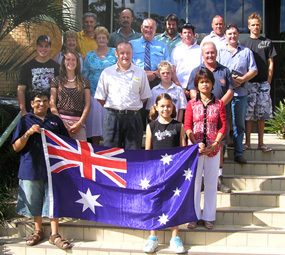 There are many types of multi-national families that may be created in the country, from new citizens hailing from foreign lands who meet their partners in Australia and form new unions, to families that have and raise children in Australia, resulting in offspring who may be curious about their family’s ethnic origins but who self-identify as Aussies. The possibilities for diversity within families are nearly endless, and Australians are known for their openness to this diversity ña quality that newcomers are sure to find comforting as they adjust to their new lives and think about their complex identity. An especially important consideration for multi-nationals within Australia is the preservation, if desired, of former languages, traditions, contacts, and other elements from their previous homes, especially when children are involved. Though it can be exciting as well as practical to jump head-first into the spirit and culture of Australia, it is also sometimes important to retain certain aspects of one’s former citizenship, and each new citizen must go through the process of preserving as needed. Parents who want their children to feel at home both in Australia and in their former country can help create a sense of dual-patriotism, one that is likely to be supported by others within the community. Moving to a new country and becoming a citizen can be a daunting process, especially for families of any size that may feel singled out because of their multi-national status. After experiencing the diversity of Australia, however, citizens who take the Australian citizenship test and complete the other steps necessary for official status can find a warm reception and genuine curiosity about the experience and challenges of being multi-national. Just as many of the first modern Australians were faced with such multi-nationality, modern migrants can find that the country is an accommodating place to express and encourage diversity in the family. This article was posted in Australian Life and tagged Australian Life, Australian Test, Citizenship Test, Opinion. mmmm why should immigrants need to preserve their native language? they should learn and speak only english if they wanna become australian citizenship, dont u all think so?